Welcome to my give.net fundraising page. 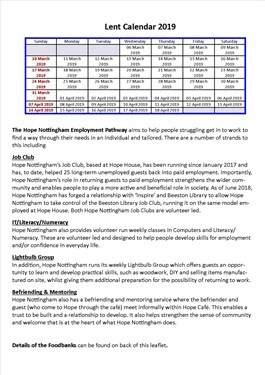 Again in 2019 we are encouraging people to give 40p per day through Lent (46 days including Sundays) in support of the work of Hope Nottingham. Lent is traditionally a time when people give things up and you may like to consider combining the two ideas. Lent 2019 runs from Ash Wednesday, 6th March to Maundy Thursday 18 April. 40p for 40 days generates £16 and 40p for 46 days £18.40. 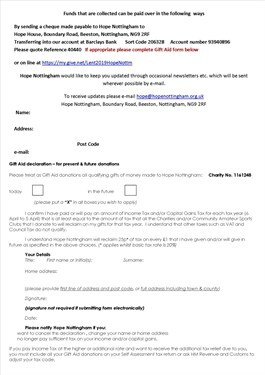 Please consider if you could look at this possibly in conjunction with ‘giving up’ a few items. This is something that can be done individually or as a group e.g. 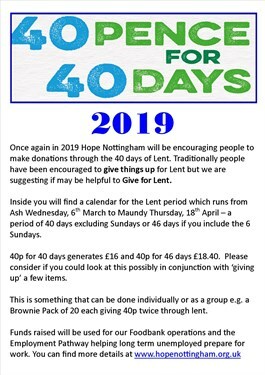 a Brownie Pack of 20 each giving 40p twice through lent. 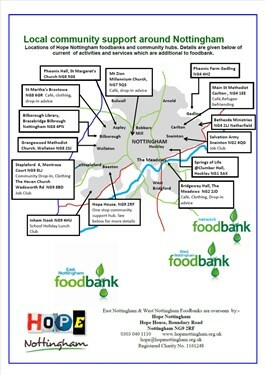 Funds raised will be used for our Foodbank operations and the Employment Pathway helping long term unemployed prepare for work. 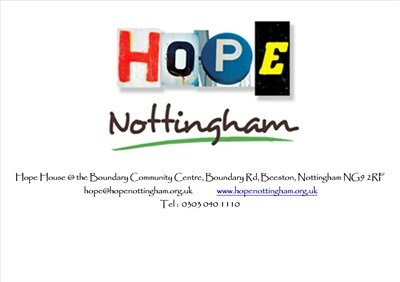 Lovely place, hope it continues to help people of the community.